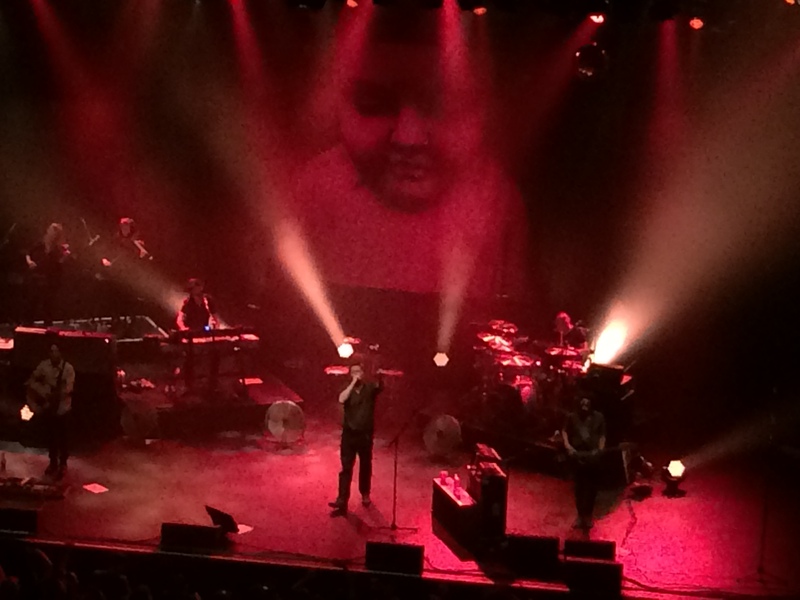 Winding down their 2014 American tour, Manchester band Elbow brought down the house at the Wiltern Theatre in Los Angeles this Wednesday evening with spine-tingling performance clocking in at just under 2 hours. 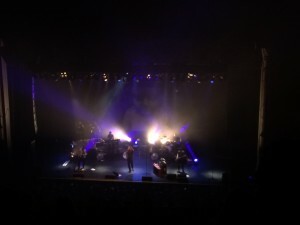 As an added treat, singer-songwriter John Grant — who was in my high school class from Parker, Colorado — opened the show with a droll, self-deprecating yet soul baring acoustic set which showcased his incredible baritone voice and keen ear for melody. 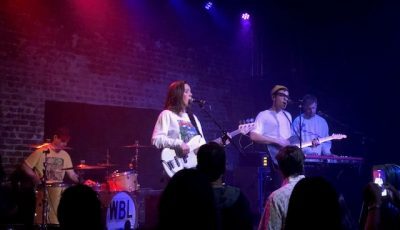 As former lead singer for the Colorado band, The Czars, John has found much success abroad in Europe with two solo albums under his belt, but is still building momentum Stateside. 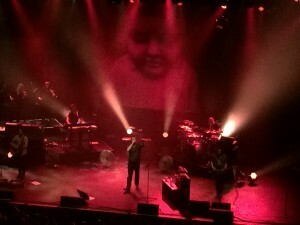 He was, however, the perfect complement to Elbow both in terms of his musicianship and stage presence. John’s penchant for amusingly inserting expletives into his pristine melodies was showcased by his latest single “GMF” (see if you can figure out what it stands for!). 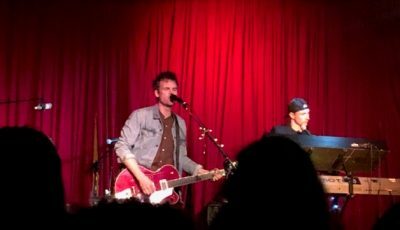 John performed two fan favorites by request — “Marz” and “Queen of Denmark” — in his all-too-brief set, graciously acknowledging Elbow before departing the stage. Elbow took to the stage roughly 30 minutes later opening with a brooding but euphoric “Charge” from their latest album, The Take Off and Landing of Everything. Elbow treated the audience to a set that leaned heavily on their most recent two albums but dipped back in their 15-year career for crowd pleasers such as “Mirrorball” and, particularly, the bluesy stomp “Grounds for Divorce.” Their current single, “New York Morning,” was dedicated to their new US label, Concord, and the trans-Atlantic recording experience which brought the album to fruition. 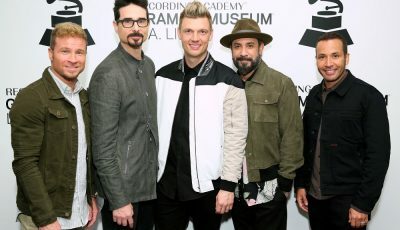 On the gentle “Scattered Black and Whites,” lead singer Guy Garvey dedicated the song to coming home, as two of the band members were now proud new fathers. Afterwards, Guy respectfully gave a nod to the hard working road crew and invited them out for a bow. Guy charmed the audience with his wit, coming off as a Lancashire lad endowed with humility and class, who also bears a considerable resemblance to comedian Ricky Gervais! Guy encouraged audience participation throughout, whether it be clapping, arm swaying or sharing vocal duties. Guy’s husky and powerfully resonant vocals were in top form as was the rest of the band: complex, layered rhythms; edgy, angular guitars; ambitious and dramatic piano fills that remind one of Rachmaninoff or Tchaikovsky; reverberating bass; and a stunning violin section. After an electrifying set of roughly 14 songs which often moved audience members into dancing in place or back and forth through the aisles, they departed the stage and kept the audience on their feet in booming applause for roughly five minutes before returning for an encore performance featuring “Lippy Kids” from their 2011 album, Build a Rocket Boys! — a beautiful, cinematic piece dedicated to the struggling immigrants who helped build America. Elbow closed with the uplifting “One Day Like This” from their acclaimed album The Seldom Seen Kid (2008), giving the audience ample participation and eventually leading the entire house into harmony on the refrain: “So throw those curtains wide / One day like this a year would see me right.” It was a perfect end to the night and to the tour, and Guy declared it the best night of the entire tour — best venue, best audience. New Country Super Star, Kelsey Waldon Talks Music and Cowboy Boots! The Troubadour Was Filled With Big Pink Musical Hearts at Us The Duo’s Show!